There seemed to be a short break from things Irish around the Garden State, or I simply gave myself a good rest from it all not truly thinking about things much. Festivals ended the spring then golf outings supporting Irish organizations and businesses sprang up all over July. Thankfully for all concerned I don’t golf, but I did make the after-outing dinner hosted by the Friendly Sons of St. Patrick of Union County. Despite the rain and the humidity the scholarship fundraiser was a success and all enjoyed. They are a sound crew of gents. Then the Gaelic football quarter finals finally rousted me from my quiet summer slumber. As all always changes, I am now in a humor where the clashes on the pitch leading to the Sam Maguire are almost more enjoyable than St. Patrick season. The weekend of the games Honey Badger fled to the beach while Fletcher the dog and I minded the northern homestead. On Saturday the craic was mighty with the lads at The Blackthorn watching Tyrone and Dublin advance as the rain poured outside here. Enjoyable, but I had no horse in those races. The Mayo match the next day was what I chomping for with hurried delight. The Sunday morning was glorious with weather so perfect that it felt almost corrupt to be sitting in a dark bar before televisions at 9 a.m. But there we were, the same faces from the afternoon before, yellow Donegal and red/green Mayo jerseys of all sizes perched around the bar with heads tilted up to the glow of screens like moths to a flame. My sympathies were with Huey from Cavan as Kerry beat his lads in the first game. My two favorite teams are Mayo and whoever is playing the Kingdom. Then we all rose to our feet again as the Irish national anthem played in the bar the second time that morning. Game on. Mayo was focused, deadly and fast. Two goals within 16 minutes and you knew the game was over. Donegal didn’t know what hit them. Their play wasn’t a typical Mayo fluke of a game from the past. They played crazy serious. The Mayo supporters gathered could actually relax at halftime, not worrying for once that the lads would blow it in the second half. 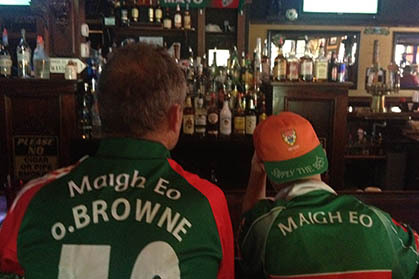 That didn’t stop the joyous, almost surprised, cheers in the Mayo-owned pub until after the final whistle blew. Often I have complained about the difficulties of watching the Gaelic games in the Garden State, a place which claims more than one million Irish Americans. I could only come up with four spots in New Jersey that show the GAA. They are The Blackthorn in Kenilworth, The Dublin House in Red Bank, Mulligan’s in Hoboken and Tommy Fox’s in Bergenfield. Thanks to Pat Kelleher, a Battalion Chief with the Roselle Fire Department and a fine drummer with the Union County Police and Fire Pipes and Drums, I now have two more locations. The Blarney Station and Pub in East Rutherford and The Poitin Still in Hackensack show all the Gaelic games as well. I hope I missed a few stops and please let me know if I did. You can write me at jimlowneyphoto@yahoo.com. In the meantime, set aside the first Sunday morning of autumn and watch the battle for the Sam Maguire at Croke Park in Dublin. It will be better than St. Patrick’s Day. Especially when Mayo wins it all.